How can Idneo add value to the Medical Sector? Home/IDNEO, MedTech/How can Idneo add value to the Medical Sector? Medica, the biggest trade fair on healthcare closed its 2018 exhibition last Thursday. 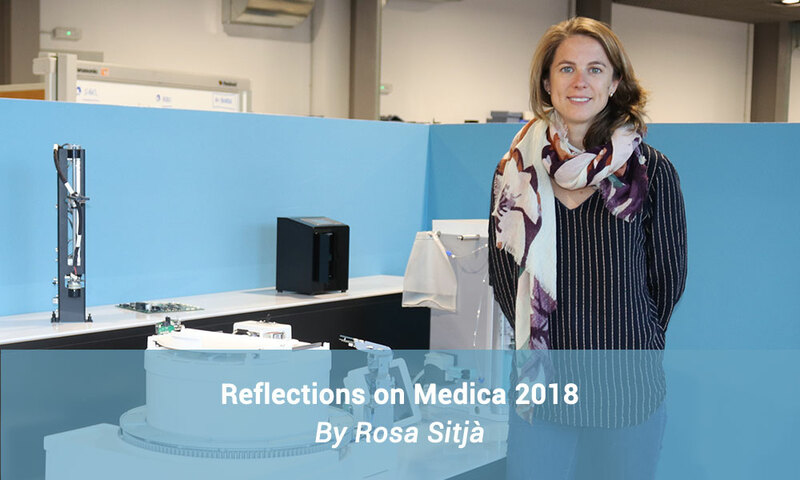 This year’s Medica gathered several innovations that can be seen in the software and hardware improvements that leads to new solutions with devices for managing some to the most difficult challenges. What caught our attention though, is the increasing focus on the point-of-care systems and particularly advanced diagnostics that require only a single drop of blood, urine or saliva and results can be interpreted within minutes. The growing demand for medical devices, together with the increasing focus on Internet of Things (IoT), has raised the next big question: how fast the IVD segment will be IoT connected? The software and IT sector are stepping up to improve efficiencies, increase security and drive revenue opportunities in many areas such as remote monitoring, better management of IVD devices, predictive maintenance or advanced data analytics to better care their patients. These new opportunity areas give additional opportunities for more advanced at-home testing. We are also seeing an accelerating trend among our customers towards outsourcing the development and production of automation solutions to partners such as Idneo. We have seen in Medica that the medical device industry is subject to significant technological advances and product innovation and development. Idneo is committed to partner with its clients to continuously design new products, update existing products and develop new technologies to meet its customers’ demands. This year’s Medica hosted an increased number of organizations active in the field of In vitro Diagnostics. Looking to commercial activities, we have realized an important concern of European manufacturers regarding the more stringent regulation that came into effect in May 2017 and will require to deal with changes in the products coming to market. How this will affect in terms of cost for manufacturers will be seen but we foresee a slower rate of Asiatic products coming to the European market. Thanks to many years of reliable and trusting cooperation with our customers we are today better positioned than ever to benefit from this positive market environment and to respond quickly to potential changes on the market.